First I want to thank every Officer, Delegate and member who made this year’s annual session such a success. 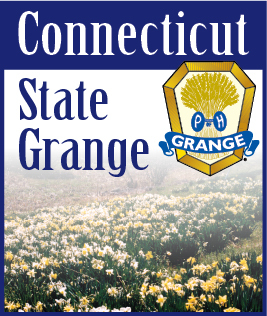 We dealt with over 35 resolutions and set a course for this State Grange. I was not surprised we were not able to develop a policy on GMO’s. The Delegate body made a very good step forward and the State Grange Ag Committee will be working to developing a policy for your consideration next year. We are contacted regularly for our position on this issue, so it is extremely important we do so as soon as we can. I am calling upon ALL members of the Grange to contact your Representative and Senator to explain to them the importance of an expedient passage of the 2013 Farm Bill. The State Grange Ag and Legislative Committee will be meeting very soon on this issue. As was stated Connecticut (as a whole) did not have a net gain in membership, we actually had a net loss of 141 members. Some Grange showed very impressive net gain and I applaud them for their efforts. The total new members taken in as of 6/30/13 were 108. Our message three years ago was the same as it is today, ONE new member per Grange per month. I told everyone upon returning from National Session last year there was a resolution introduced to raise the dues paid to National Grange by $4.00 per member per year. A Grange with 100 members would see an increase in dues paid to National of $400, and this would be after your Grange has already collected its dues for the year. This additional burden will fall directly on the treasury of your Grange. I will not be surprised if we will be dealing with a resolution calling for a dues increase to National Grange again this year. We can stop dues increases at ALL levels by increasing our membership; by doing our part to ensure a sound future for our Grange; by taking responsibility for our own Grange. I want to challenge EVERY member to ask at least one person to join the Grange this year. You will be VERY surprised what they may say. I want to congratulate Shelley Racine on her election and installation as Ceres as well as Robert Sendewicz and A. Ruel Miller on their election and installation to the State Grange Executive Committee. I know you will all do an outstanding job for the Grange. This is a reminder to all Officers, we are continuing the State Officer visitation program again this year, please send me the Pomona Granges and Community Grange you are planning to visit as soon as you develop you list. We will again post this list in the Granger. Brothers and Sisters please join me by committing to grow your Grange as we Grow Our History for a Stronger Tomorrow.